If you’re missing a tooth, or several teeth, but you’re hesitant about getting a traditional set of dentures, a tooth implant or a dental bridge may be right for you. At Nashville Center for Aesthetic Dentistry, we’ll work with you to find a treatment plan that will restore your smile and keep it healthy. 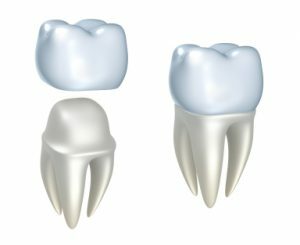 A dental bridge is a set of two or more artificial teeth that fit in the space your natural teeth left behind. It is fused to porcelain crowns on either side of the missing teeth. A dental implant procedure also replaces a single missing tooth. In a dental implant procedure, your dentist inserts a metal post deep into your jawbone to replace the root of the missing tooth. This is one of the most important steps because it keeps the artificial tooth from moving around in your mouth. If your jawbone is too soft or thin, you may also undergo a bone graft, which is not as scary as it sounds. Sometimes, this can be done on the same day as your implant surgery. After the post is implanted, a process called “osseointegration” happens. This means that the post has bonded with the bone. It usually takes about three to six months. Your dentist will fit you with a temporary denture until it’s time for the second procedure. Once this is complete, you may have to come in for another procedure to attach the abutment, a smaller post where the crown will be placed. After your gums heal, you’ll get fitted for a permanent or removable tooth or bridge. While the entire procedure can take several months, it is worth the time investment. Dental implants are durable, long-lasting, and radically transform your smile. If you have questions, or would like to schedule a consultation, call our caring team of experts at 615-371-8878 today!